The holidays meant getting together with family and what better thing to do than inflict nail polish fumes on them? My first victim was my sister’s boyfriend’s thumb. I used Essie’s “Bell Bottom Blues” and Sinful Color’s “Casablanca” for the fastest drying time possible. The robots came from Nicole Diary’s ND009. I believe the robots are supposed to represent the two of them because they are disgusting, cheesy people. Who kiss way too much. And then I rotated between my mom’s nails and my sister’s. Since it was just after Christmas when we started, we stuck with generic winter themes. 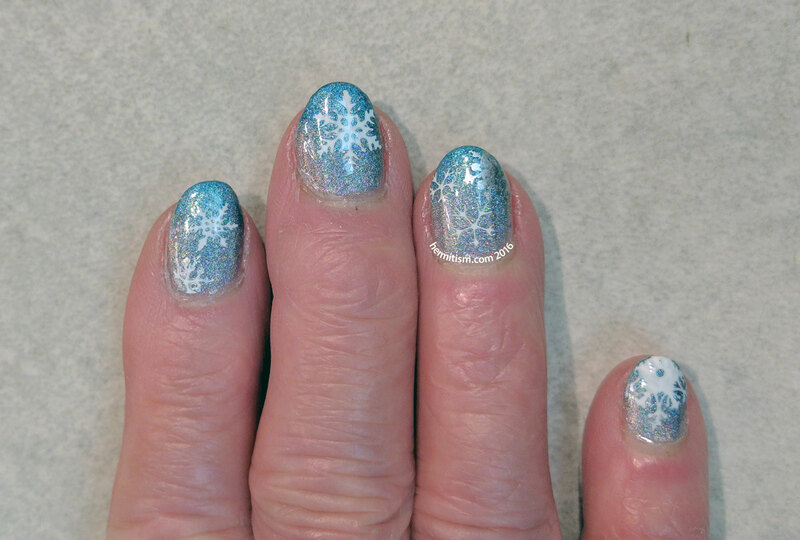 For my mom, I used a gradient of holo polishes (ILNP’s “Mega (S)” and Color Club’s “Over the Moon”) and stamped silver (Sinful Color’s “Casablanca”) and white (Color Club’s “French Tip”) snowflakes on top using Ejiubas’ EJB-03. 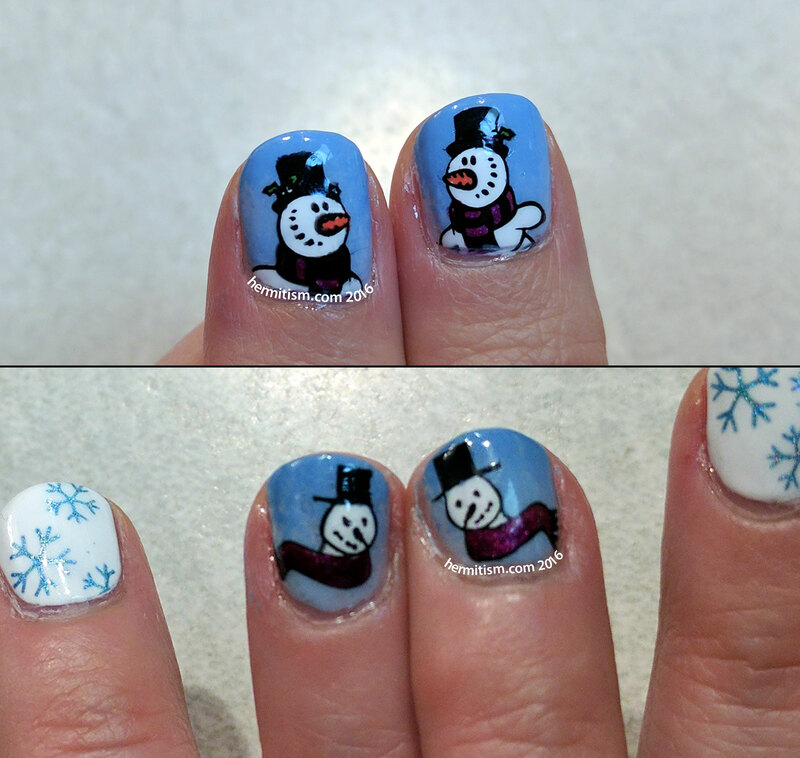 My sister’s nails took a lot of little snowman decals on top of a gradient background (Sinful Color’s Kylie “Magik Touch” and Sally Hansen’s Insta-Dri “Set Sail”). 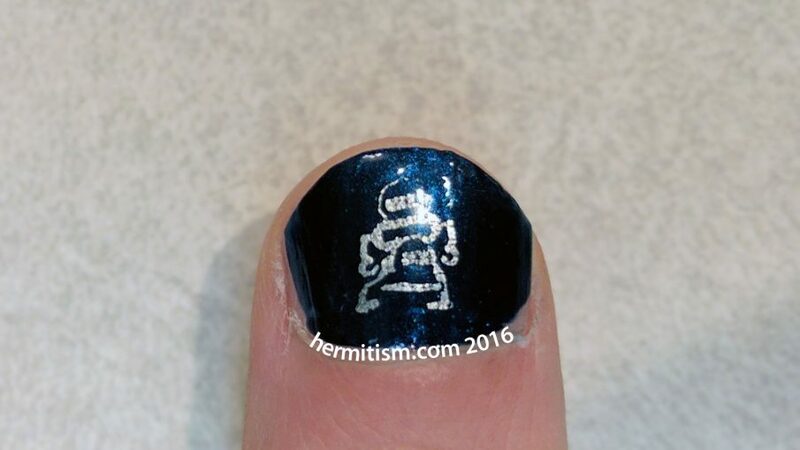 A subtle gradient and letting the decal end at the edge of the nail seems to be one of the best ways to keep a decal or stamp from feeling like it’s floating in space. The decals were stamped with Wet ‘n’ Wild’s “Black Creme” from Ejiubas’ EJB-03 and another brand’s plate identified as SPH-003. I filled them in using “Sinful Color’s “Exotic Green”, Essence’s “Wild White Ways”, Milan’s “Sugar Plum”, and Essie’s “Sunshine State of Mind”. 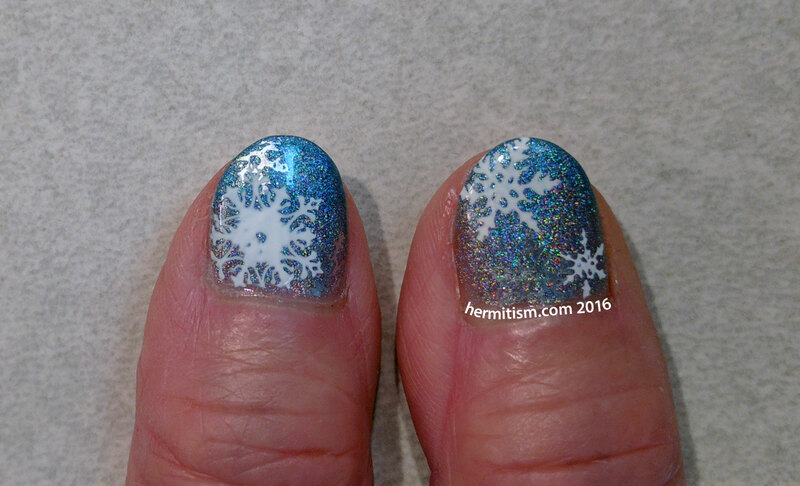 The snowflakes also came from the Ejiubas plate and were stamped with Color Club’s “Over the Moon” on top of Essence’s “Wild White Ways”. My sister would also like the world to know that one of the snowmen is evil and its twin is good. I just thought the picture of her thumbs (above the ‘twins’) was cute. My sister and I have done nails before (although this was the first time I just painted them for her), but it was the first time for my mom. Hopefully we’ll do them again sometime since she seems to enjoy it. 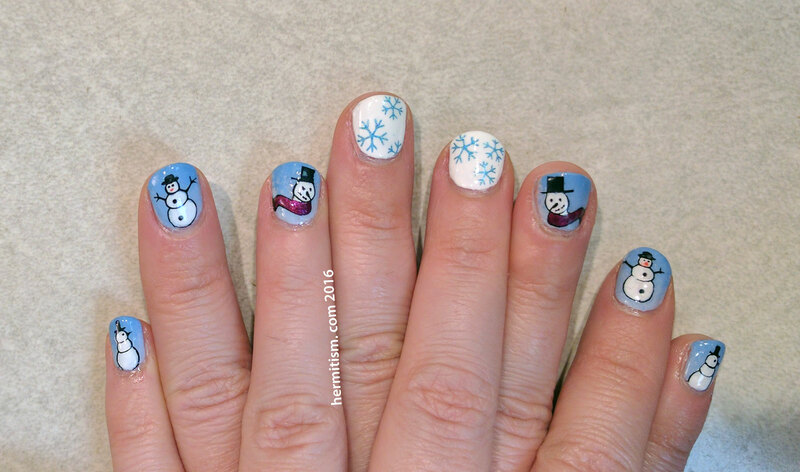 Meanwhile, my biggest nail art regret over the holidays was not bringing my cuticle softener! Totally my bad. But everyone was happy and had fun. Except my cat. She was grumpy most of the time because she wanted to be at our home where she is the queen. Sucker.